1 About six-in-ten U.S. adults (59%) say abortion should be legal in all or most cases, compared with 37% who say it should be illegal all or most of the time. Public support for legal abortion is now as high as it’s been in two decades of polling. 2There is a substantial partisan and ideological divide on abortion, with Democrats much more likely than Republicans to say it should be legal in all or most cases. 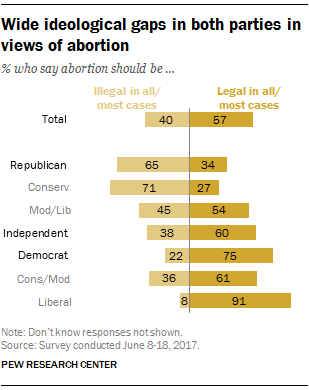 This gap is even larger between liberal Democrats and conservative Republicans: Nearly nine-in-ten liberal Democrats (88%) say abortion should be legal in all or most cases, compared with only about three-in-ten self-described conservatives in the GOP (27%). 3When it comes to the Supreme Court’s landmark 1973 ruling, about seven-in-ten Americans (69%) say Roe v. Wade should not be completely overturned. Democrats are far more likely than Republicans to hold this view, and there are also significant differences by education level and religious affiliation. Nearly nine-in-ten of those with postgraduate degrees (88%) say the court should not overturn the decision, versus about seven-in-ten of those with a college degree (74%) or some college experience (70%) and 62% of those with a high school diploma or less education. There are no significant differences on this question by gender. 4 More than four-in-ten Americans (44%) say having an abortion is morally wrong, while 19% think it is morally acceptable and 34% say it is not a moral issue. 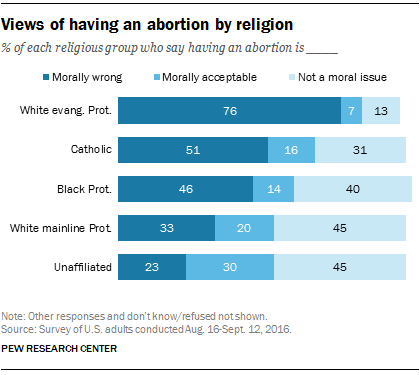 These views also differ by religious affiliation: About three-quarters of white evangelical Protestants (76%) say having an abortion is morally wrong, but just 23% of religiously unaffiliated people agree. 5Many states around the country have enacted their own abortion restrictions in recent years. The Guttmacher Institute, a research group that supports abortion rights, reports that 27 states currently enforce waiting periods of between one and three days for women seeking abortions. And 11 states limit abortion coverage offered through private health insurance plans, most commonly to restrict abortions to instances in which women’s lives are in danger. Note: This is an update to a post originally published Jan. 22, 2014.